It’s time to talk turkey. Thanksgiving is one of the oldest American celebrations—officially declared a national holiday in 1941. It celebrates the 1621 autumn harvest feast between early Pilgrims and Wampanoag Indians at modern-day Plymouth, Massachusetts. 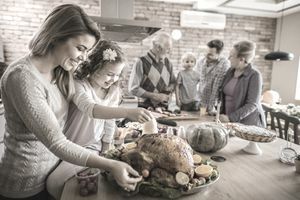 While that first banquet almost 400 years ago celebrated the extraordinary courage and sacrifice of two different groups who came together to survive the hardships from bad weather and illness, today Thanksgiving has evolved into a much more comfortable celebration for American families everywhere. Statistics from the American Farm Bureau Federation’s annual Thanksgiving survey show that the average cost of a Thanksgiving meal for 10 people will cost $48.90 in 2018. That's the lowest average price since 2010. The chart below shows a breakdown of average yearly cost since 1947. The holiday grocery list includes a 16-pound turkey, 14 ounces of stuffing, 3 pounds of sweet potatoes, 12 dinner rolls, 1 pound of green peas, 1 pound of carrots and celery, 12 ounces of cranberries, 30 ounces of pumpkin pie mix, one-half pint of whipped cream, and one gallon of whole milk. This average price goes up to $61.72 if you add other popular ingredients like a 4-pound bone-in ham, 5 pounds of Russet potatoes, and 1 pound of frozen green beans. Another 2018 survey from LendEDU, however, says that the average cost of the Thanksgiving celebration will be much higher—estimating $175.65 per person, $10.51 more than 2017. This includes other related expenses like travel. In 2017, the AAA calculated that 50.9 million Americans traveled over 50 miles from home for Thanksgiving, and average car rentals spiked to $70 during that same holiday. Keep these five basic tips in mind when planning for future Thanksgiving Day celebrations and other family holidays. Before you do anything else, put together a Thanksgiving Day budget. In doing so, try to consider every little thing that you might spend money on, from food to place settings to festive decorations to adult beverages. Once you have listed out all of the things that you are going to need, assign a dollar amount to them and do whatever it takes not to spend a penny more. Remember, although statistics show that the average household only spends $48.90 on Thanksgiving dinner, the actual amount that you spend that day can go up drastically once you add in decorations or any kind of wine or alcoholic beverages. Over the past few years, we’ve implemented a Thanksgiving strategy that it is helpful to everyone’s wallet. The hosts of the Thanksgiving Day meal supply the turkey, and the guests bring all of the sides to supplement the big meal. This is a great way for everyone to feel like they are pitching in and takes a lot of stress off of the host/hostess at the same time. Ask your friends or family to bring a special dish that reminds them of Thanksgiving dinners when they were young and they will be happy for the opportunity to walk down memory lane. Get the children involved and have them help you out in the kitchen so that they can proudly display their hard work. Suggest that everyone bring a bottle of their favorite wine to share with the group. If you go into a beautifully put together store like Crate & Barrel or Pottery Barn this holiday season, chances are you will walk out spending way more on decorative items than you ever imagined. And that is exactly what their job is- to make the sterling silver turkey napkin ring holder look like something that you just can’t live without! I agree that these items are beautiful, but if you are sticking to a budget, consider some alternative retailers that sell similar items for a fraction of the cost such as Party City or Cost Plus. Are the Black Friday sales really worth it? Have you found in the past that you overbuy just because things are on sale? Many people actually wind up spending more, not less. Consider taking the year off from the mass chaos of the local mall and instead put that money towards something that really matters such as a charity or a cause that is close to your heart. If you decide that Black Friday shopping is absolutely essential, be sure that you add it into your original budget. And last but not least, please keep in mind what this season is all about. This is the time to celebrate the season itself and all of the significance that it holds. It’s a time to be with people that you love and to reflect on the things for which you feel thankful. No one is going to remember next year if you served the best turkey they ever had on the most decorated table they have ever eaten on. They are going to remember that you spent this great day together. Does Your Budget Have These 9 Features? Do You Know The First Step to Wealth and Financial Success?